BusyCal requires permission to access your Me Card in Apple Contacts for creating and responding to meeting invitations. It also requires access to your Contacts for displaying Birthdays and Anniversaries in your calendar. 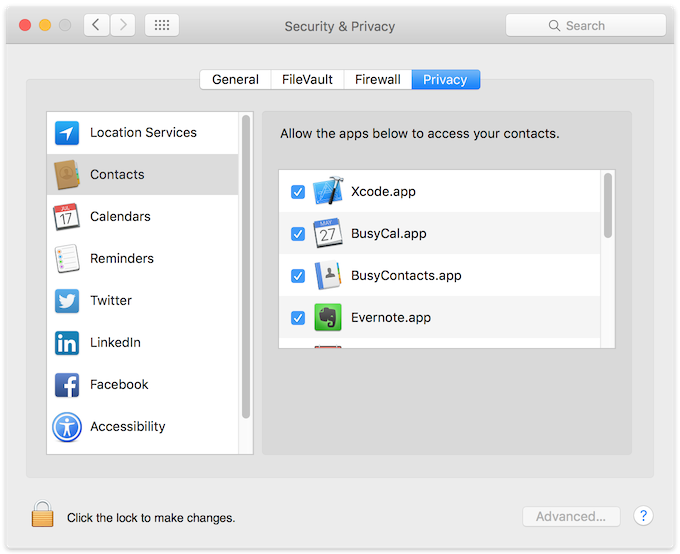 Open System Preferences > Security & Privacy, select Contacts in the left sidebar, then check BusyCal.app. How do I setup my Me Card? If using BusyContacts, launch BusyContacts, select File > Go To My Card, and make sure your Me Card contains a matching email address. If using Contacts, sometimes BusyCal can't get your Me card from Contacts. Usually this can be solved by having Contacts re-establish your Me card.